The X and Square quilt block features several of the underused (in my opinion) patches called square in a square. I like these quilt units because they are versatile and if you get a little bored with other commonly used patches, these can be your new challenge. I was having so much fun with this block that I decided to feature both a three colour version and a four colour version. It was an interesting surprise to see the different looks that evolved in the resultant quilts. The quilt block is a nine patch and goes together quickly. 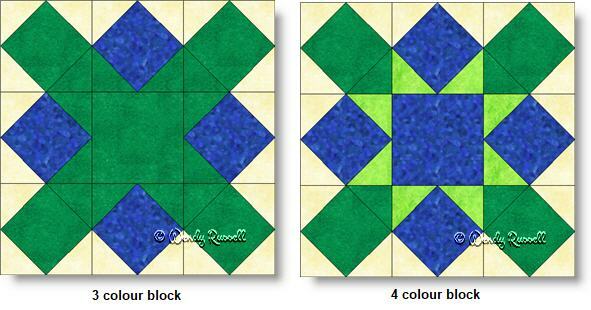 The sample quilts illustrated in the image below are using the three colour option. When you download the free quilt block pattern, you will see my other quilt samples, using the four colour version as well. Enjoy!